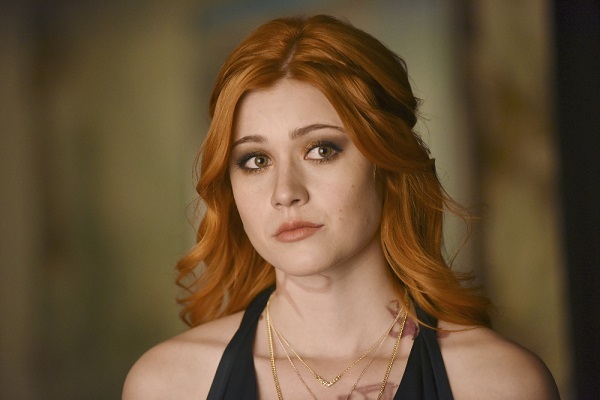 Katherine McNamara stars as Clary Fray in the breakout hit Shadowhunters, which returns to Freeform on Jan. 2. We spoke with Katherine about what to expect from Shadowhunters season 2, what’s next for the Clace ship, her work with the UN Foundation’s Girl Up campaign, and more. Last month, Shadowhunters was announced as a People’s Choice Awards nominee in the Favorite Cable Sci-Fi/Fantasy TV Show category alongside American Horror Story, Orphan Black, Teen Wolf, and The Walking Dead. What was it like to get that news? Katherine McNamara: It’s really incredible, honestly. We were also nominated for three Teen Choice Awards, and two of them we ended up winning, which was incredible. To have that kind of recognition for our show in the first season is amazing. Even our fandom was recognized at the MTV Fandom Awards! People’s Choice is a huge thing for us, and we’re so appreciative of the fans for voting us in. The company we’re keeping with all of the other nominees is blowing our minds! At the end of Shadowhunters season 1, Jace left in the portal with Valentine. 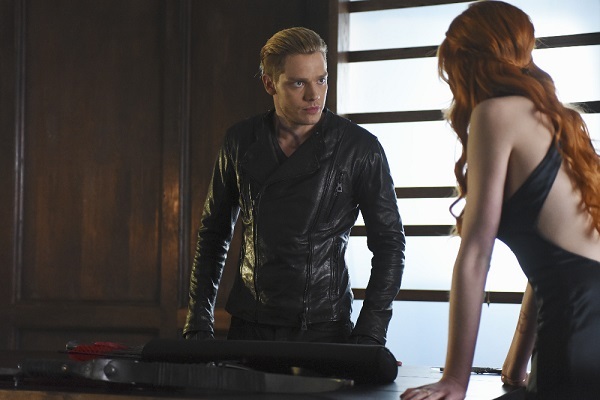 As season 2 begins, how does Clary deal with Jace’s absence? What does this mean for the Clace ship? Jace’s absence is a huge driving force for Clary. Not only did Jace find out that Clary is his sister, but he also found out that Valentine is his father. [Clary] knows more than anyone what finding out that evil is inside you can do. When Clary found out that news, she had the other Shadowhunters around her supporting her, whereas Jace is literally in the clutches of that evil. Clary is really desperate to get to him and be there for him as a sister to help him through that. They have always been drawn to each other, but now they’re trying to push anything else aside and deal with each other as siblings. Clary knows she needs Jace in her life and however she can get that, she will. Moving forward, Clary’s also dealing with the fact that her mother is back. Her mother still sees her as the little girl that you saw at the beginning of season 1, but now Clary’s a Shadowhunter. She’s grown up, she’s learned a lot, and getting her mother to see her as that is a bit difficult. To that point, Clary is growing up. She’s becoming a Shadowhunter and she’s starting to come into her own. She gets to take charge and fight some of her own battles and be a little bit more of a badass. Although Clary was reunited with Jocelyn in the Shadowhunters season 1 finale, that doesn’t change the fact that she was lied to for 18 years. How is that going to be addressed in Shadowhunters season 2? It’s addressed very directly. Like I said, Clary and Jocelyn have some issues to work out. Clary needs Jocelyn to see her as an adult and as a Shadowhunter. Jocelyn still wants to protect her, whereas Clary doesn’t necessarily trust her mother anymore. So, they have a few issues to discuss! On top of that, there’s more important issues at hand, meaning Valentine and the rest of the Shadow World destruction that’s happening. After being introduced to the Shadow World in season 1, Clary spent the majority of the season trying to develop her identity. Now that she has some experience, will we see a stronger Clary in season 2? Absolutely. That’s something I love about season 2. We really play into Clary’s maturity and into her growth and what she’s learned. She made a lot of mistakes in season 1. She learned a lot of lessons, and she doesn’t forget them moving into season 2. Also, like you said, she was thrust into this world. She never really had the chance to actually make the choice to become a Shadowhunter. That’s something that we deal with at the top of the season: Does she really want to be a Shadowhunter? Does she want to go back to her mundane life? Can she even go back? What lies ahead for Clary, and what path is she going to choose? Zooming out from Shadowhunters, you’ve done a variety of TV projects, films, and stage productions. Is there a medium you prefer? What are the biggest differences between them? I wouldn’t say there’s one medium I prefer because I like to keep switching between them. I love television for its immediacy and its pace. It’s the golden age of television right now, and there’s so many different stories being told. I love film because you can take more time with it and there’s more of an intimacy to the filming process. You can take more risks in film, which I love, and there’s a lot more artistic freedom. Then theater’s a whole different animal because it’s live in front of an audience and every show is different. You’re experiencing the same character journey, but it takes on a new life every performance. I love them all, and I never want to be stuck in one thing for too long. Other than Shadowhunters, what do you have coming up that fans can look forward to? The third Maze Runner film is coming at some point. I don’t have any information on that right now, but I’m very excited for it! On top of that, I’m doing music. It’s something I’ve been looking to do for a while, and I finally had the time to commit to it. I’ll be releasing music very soon! It sounds like you’re doing a lot of things, but you’re able to balance them. I like to stay busy! You also work with the United Nations Foundation’s Girl Up campaign. Can you talk a bit about the campaign and your involvement with it? I’m an ambassador for Girl Up now, and I’m so thrilled and so honored that they asked me to be a part of it. It’s such an incredible organization. I remember as a little girl, I always wanted to make a difference. I looked at these issues going on in the world and I wanted to be part of the change and be part of the solution, but I never knew how. That’s exactly what Girl Up is doing. It’s a by-girls-for-girls organization that allows young women opportunities and platforms to make a difference in our world and to really start making some headway on issues that other young girls around the world are facing. What I think is so fabulous is that the programs Girl Up creates tackle the small issues that directly affect young women’s health, education, and job opportunities. They make a direct change and have a direct influence on young women being able to choose their own path. I think that’s something that so many girls in developed countries take for granted. The fact that we can help out and make a difference – even start the momentum of that change – is huge! Girl Up sounds like a good match for you, especially because you’ve been so committed to your own education. You have a business degree and you’re in the middle of getting your master’s in literature. How are you doing that and being an actor and also singing?! Well, I don’t sleep much! I’m a workaholic, but I love what I do. Everything I do, I’m passionate about, so it’s not work to me. It’s a joy to pursue it. Education has always been a huge priority to me, and I think it’s something that a lot of people take for granted, so I’m doing everything I can to spread the appreciation and the love of learning. [Education has] always been a perspective-expanding experience for me, and I want other people to see it that way as well. Looking to the future, do you see yourself continuing to do acting or going into a field in which you have a degree? Honestly, I see a little bit of both. I use my business degree every day. I read my own contracts, I manage my own finances. Because I have the education, I know how to manage my career. I know what the elements of a contract mean and what the ramifications are in practice. If I have the opportunities, I’d always like to be onstage or in front of the camera, but someday I’d like to be behind the camera too. I’d like to direct, I’d like to produce. If I ever have a story that I want to tell, I’d love to write. I want to stay in this creative space because I love it so much. Lastly, here’s a question that a fan tweeted to us. If you could describe Clary in Shadowhunters season 2 in three words, what would they be? Thanks to Katherine McNamara for the interview! Keep up with Katherine McNamara on Twitter and Instagram, and don’t forget to watch the Shadowhunters season 2 premiere Tuesday, Jan. 2, at 8/7c on Freeform. Following Shadowhunters, Freeform will air the two-hour premiere of Beyond. We interviewed Beyond star Burkely Duffield about what to expect from this intriguing new show!